FormLA Landscaping principal Cassy Aoyagi integrates drought-resistant plants into her Southern California projects. 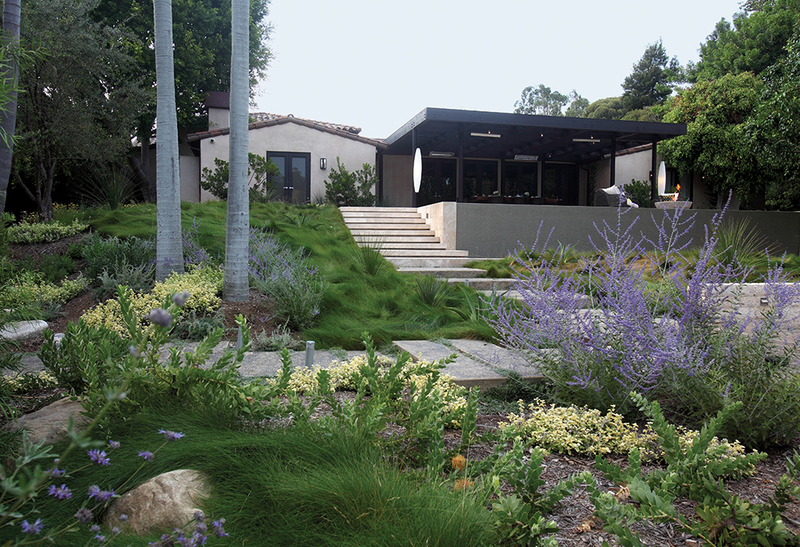 For a Los Angeles home, Aoyagi used an IdealMow lawn of native grasses, and Dymondia, Juncus, and Hummingbird Sage. What are your most favored drought-resistant plants? sun and shade, with flower spikes that draw hummingbirds. How can we capitalize on city initiatives such as the Los Angeles Department of Water and Power’s turf removal program (aka Cash for Grass), which offers people $2 per square foot of grass traded for native plants? Capitalizing on this initiative might include integrating native plants and irrigating new plantings with a subsurface, low-volume alternative to overhead spray. The incentives also present a wonderful opportunity to update your space. Approaching a sustainable landscaper in your region is a great start. Each municipality has its own set of incentives as a result of the statewide Water Efficient Landscaping ordinances. In addition to Cash for Grass, residents can get rebates for replacing turf in specific areas, like parkways. Are programs like these preparing us for the inevitable? No more lawns? That would be a dream come true! Aside from all the compelling arguments regarding sustainability and water’s impact on the fiscal health of Los Angeles, there is just something incredibly dull about a traditional lawn. [L.A.’s] diverse architecture and distinctive culture deserves more. We have native grass varieties that can be kept short or long, feel soft or rugged, grow flat or mounded, and come in every shade imaginable. Are there low-water, foot-friendly grasses that we can plant instead of traditional lawns? For areas that receive a great deal of foot traffic or play, we like two IdealMow lawns: Carex pansa, which is hearty and can be mowed to look and function much like a traditional lawn, and UC Verde, a hybrid buffalo grass that is incredibly hard to distinguish from a traditional lawn. Is there such a thing as a “dry” garden, or one that uses virtually no water?